Sadly for us, they much prefer to fight our heroes than each other. Batman: What do these guys want, anyway? Superman: To Take Over the World... or rob banks. I forget. — Justice League Unlimited, "Clash"
Robert A. Heinlein's The Rolling Stones points out that for every Superhero, there must be a Supervillain to give him purpose. Heinlein's The Number of the Beast further notes that if the villain is killed, he must be replaced by a son that's just as evil and badass as his predecessor, if the story is to continue. In short, where would that caped clown be without you, his rival, his foil, his Arch-Enemy? Nowhere, that's where. You've been around for as long as he has, after all!note Well, ok, technically most villains show up a few years after their respective heroes, both In-Universe and without. But wouldn't it be so boring if we hadn't? Like your heroic counterpart, you have powers, skills and/or technology that elevate you above the average person, or indeed, the average criminal. Really, mundanity is for suckers. Why rob a bank by barging through the front door in a ski-mask, when you could release crippling fear-toxin through the AC, bust through the wall in your power suit, teleport into the vault, or cast a spell that turns the staff to stone? Of course, you need to look cool while doing this, and don't forget those identifying marks, unless you want to stay under the radar. If you have a day job, you'll wanna keep it quiet too, because those parti-colored do-gooders will be gunning for you. And while we're on the subject, don't those bastards just ruin everything? Spoiling your plans for as long as you can remember! Heck, they even trashed your house that one time! I mean, you're only knocking over banks...or leveling cities, or taking over planets...y'know, basically doing your own thing. Why've they got such bugs up their butts anyway? What'd you ever do to them, aside from stalking them and antagonizing their loved ones? You do that to everyone! Anyway, you've had enough! You're gonna bust out of prison again, get some friends together, and really show them this time! It's not even about your goals anymore! It's about seeing those costumed vigilantes pay for their interference! After all you've survived, you know you're due for a win. This time it'll be different! You hope. 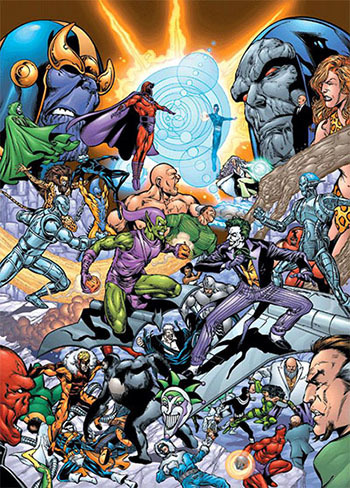 Supervillains can be found in most works that feature Superheroes. See also Diabolical Mastermind, Evil Counterpart, The Psycho Rangers, Dark Magical Girl, Big Bad.